E-commerce has revolutionized the way the world does business. It has created greater convenience for consumers, enabling them to purchase what they want, whenever and wherever they want. It has also generated vast new opportunities for retailers as well as new challenges, particularly in the area of sustainability. Packaging waste and emissions have gained greater attention in recent years. Twenty-five years ago in China, it was unthinkable to throw anything away that could be re-used; but as consumption has increased, our habits have evolved: with more purchases comes more waste. JD.com believes that, as retailers, we must actively take steps to make global consumption more sustainable – especially those of us that are building the future of retail through e-commerce. In 2017, China’s e-commerce market grew by 19.8% to US$3.82 trillion, according to China’s Ministry of Commerce, so these challenges are increasing significantly every year. The JD Foundation is an affiliate of our company with a focus on sustainability. Working together, we are coordinating an innovative plan across all departments of our company to re-think the way retailers do business. Key components of the JD Foundation’s sustainable strategy can offer a guide to how e-commerce companies can make a difference. Tackling and removing excess waste from the delivery process is a key issue which should form a major part of companies’ sustainable consumption goals. For example, JD gives customers the option of returning boxes for re-use and recycling, and promotes this through our partner retailers and delivery companies. Introducing reusable boxes made from biodegradable materials can also play an important role in cutting waste and making consumption more sustainable. Many companies, including JD, are implementing plans like this already. Even reducing the thickness of the tape used to seal boxes plays its part in sustainable consumption, demonstrating that every little step makes a difference. By doing this, we’ve saved more than 100 million meters of tape in the past two years – that’s enough to stretch around the globe twice. In addition, going paperless by making all invoices, receipts and order sheets digital can help companies cut down on waste, and again many companies including JD are already doing this. Updating methods of delivery and converting from conventional fuel vehicles to new energy vehicles will greatly reduce emissions. JD has more than 80,000 delivery employees across China, and to-date we have converted over 5,000 of our delivery vehicles to new energy, and plan to work with our partners in the coming years to convert hundreds of thousands more. By the time the entire fleet is green, we expect to reduce our yearly CO2 emissions by several million tons. Making better use of existing logistics networks will also have an impact. Couriers deliver goods to your door, so why don’t they pick up your used items too? 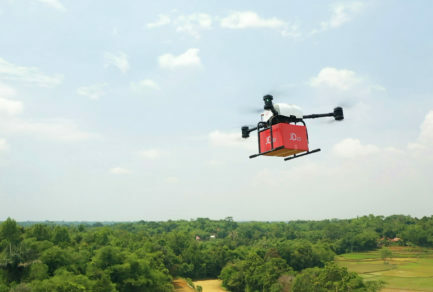 This approach can use established assets in e-commerce and delivery companies’ business models, and can be used as a driver for future growth. Another key element is working with retailers and manufacturers to ensure that the products they produce are more sustainable – specifically, encouraging manufacturers to use more sustainable processes that reduce any negative environmental impact. This is especially important in terms of natural resources. We are currently working with our partners to ensure products such as Alaskan cod, Chilean salmon and black tiger shrimp from Vietnam are from sustainable sources. Partnering with green advocacy groups to launch sustainable consumption campaigns aimed at the public can get the sustainable consumption message out there. For example, JD is working with groups, including the United Nations Development Programme, to address waste and pollution throughout the consumption process. Implementing campaigns and donation drives for used items such as clothing, toys and books can allow these items to be repurposed and given to charities and non-profit organizations. This extends the life cycle of products and reduces waste, and contributes to other social needs such as alleviating poverty. We think that spearheading public awareness campaigns can contribute greatly to changing how people approach consumption. As a leader among e-commerce companies, JD has taken on this responsibility. If we can change current attitudes of public consumption culture, then that is half the battle won. To truly change the current shopping culture, consumers need to get involved too. JD and the global e-commerce community more broadly are just beginning this journey towards sustainable consumption, but it’s important for all of us to start now while the industry is still rapidly evolving. Consumption should be sustainable both in terms of reducing the impact we have on the environment, and in terms of the viability and longevity of the programs we create. If we can build the foundations for sustainable consumption in a way that makes better use of the assets in our business models, we can build a better future.